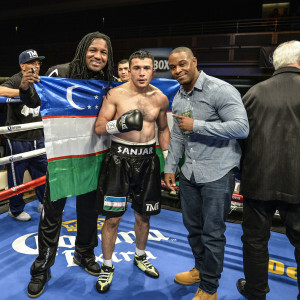 “When I was young,” welterweight Sanjarbek “War” Rakhmanov tells me, “twelve, thirteen years old, Las Vegas was my goal.” Not just Las Vegas, perhaps, but also the kinds of big fights that Las Vegas offers. If reaching great heights was the endgame, the undefeated Rakhmanov, can perhaps consider himself on his way. Not only does the native of Uzebekistan live and fight in Vegas now, he is also a part of Floyd Mayweather’s prestigious Money Team. “I have a good team,” he tells me. “I’m really proud of that.” So far, at least, the man is more than keeping up his end of the bargain. With an undefeated record and a fight coming up this Friday against Marquis Taylor at Vegas’ Sam’s Town, it’s clear the fighter is on a roll. “He’s a tall guy,” Rakhmanov says of Taylor. “He’s boxing good…it will be a good fight. We have different styles.” The thought of fighting once again in his adopted hometown, where all but two of his previous fights have occurred, appeals to the twenty-eight-year-old. “I love that place,” he says of the boxing Mecca. Coming to America and being part of the Money Team was a sensible transition for the man after a standout armature career. “In my country,” he says, “I was number one in my division.” His pedigree was not something that went unnoticed for those eager to sign new talent. And, sure enough, Rakhmanov has his sights set on the future. A man who knows how to pressure effectively, feint, and pick his shots for maximum effect. Rakhmanov claims that he and his team “have big goals.” He’s not about to rush things, however, as too many fighters tend to on the way up. “I think a couple of fights,” he says when I ask when he thinks he’ll be ready for a title shot. “Maybe two or three.” First, though, he’ll have to get past Taylor, a man with a solid 9-1 record of his own. Rakhmanov feels ready. “Training’s going very good,” he says. The Money Team clearly has faith in its rising fighter. As it states on its website: “The welterweight prospect is patient and takes something away from each fight, enabling him to continue developing his technique and climb the ranks.” Rakhmanov doesn’t intend on letting anyone down. “I love my team,” he says. “I want to just say thank you to everyone whose supporting me,” he states later in the interview. If the fighter, who’s known as “War,” continues winning, he may start having a lot more people to thank.